What is the N Function? The N function is categorized under the Text functionsFunctionsList of the most important Excel functions for financial analysts. This cheat sheet covers 100s of functions that are critical to know as an Excel analyst in Excel and it will return a number when we provide a value. The function can be used to convert logical values TRUE and FALSE into 1 and 0, respectively. As a financial analyst,Financial Analyst Job DescriptionSee a real Financial Analyst Job Description including all the skills, experience, and education required to be the successful candidate for the job. Perform financial forecasting, reporting, and operational metrics tracking, analyze financial data, create financial models the N function offers limited use as MS Excel automatically converts values as necessary. The function is provided for compatibility with other spreadsheet programs. Value (required argument) – It is the value that we wish to convert. In Excel, dates are stored as sequential serial numbers so that we can use them in calculations. By default, January 1, 1900 is serial number 1, and January 1, 2018 is serial number 43101, as it is 43,101 days after January 1, 1900. How to use the N Function in Excel? 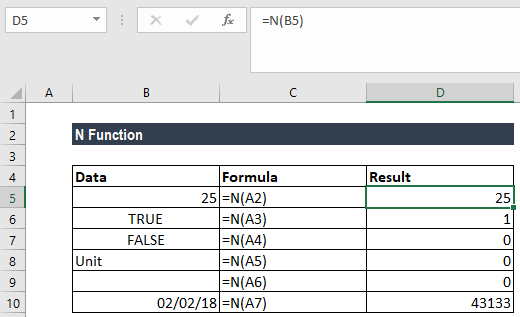 The N function is a built-in function in MS Excel. 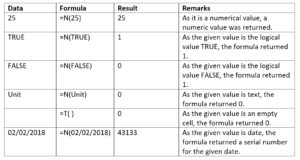 As a worksheet function, it can be entered into a formula in a worksheet cell. To show results for formulas in Excel, select the formulas, press F2, and then press Enter. If needed, you can increase the column width(s) to see all the results.